One thing I have found since mentioning to people that I was going to this concert is that Dave Matthews Band is a polarizing figure. Either you love him or you hate him. This was a little surprising to me, as they seemed rather innocuous enough to me. I really hadn’t paid much attention to them since college - but I know they tour all the time and have dedicated fans - so I figured - what the heck. It was a slow concert week this week, and had some friends going (and I also had a $15 Live Nation coupon). Dave Matthews Band has recently been taking this two set approach to their shows, first going acoustic and then going electric (with no openers). Without a strong knowledge of their catalog, particularly their live catalog, I really was there just to enjoy the company of my friends and the array of interesting people around me. The music provided a great soundtrack for that. I can’t say I had any real strong feelings about the show - other than “damn, some of these jams are long.” But they didn’t bother me either. If I ever had another group of friends going - I’d go back. 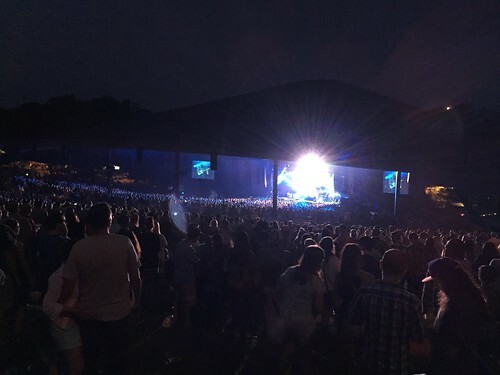 "Under overcast skies, Dave Matthews Band delivered another terrific summertime gem at Blossom last night. To my ears, the band outdid their 2014 show (despite last year's awesome Bela Fleck sit-in) mostly via Jeff Coffin's spellbinding brass and woodwind work and Tim Reynolds' electric guitar madness. The band was on-point all night."